The Unity device is intended as a treatment option for pain and functional disorders specific to the lumbar vertebral column. The aim of the device is to provide support between two vertebral bodies and initial immobilization of these bodies whilst simultaneously providing space for bone graft so that a fusion of the two vertebral bodies will in time be attained. The Unity system consists of a body manufactured from PEEK-OPTIMA, with two titanium-alloy imaging markers bilaterally, and two lateral titanium-alloy bone anchoring screws (one for each vertebra). The device also incorporates two large bone graft windows to accommodate bone graft or synthetic bone inserts. 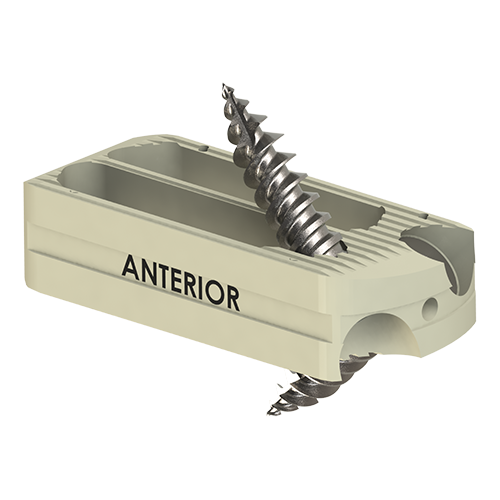 The Unity is anatomically-shaped to fit the lumbar disc space optimally, with three lateral lengths and multiple heights to restore disc height. 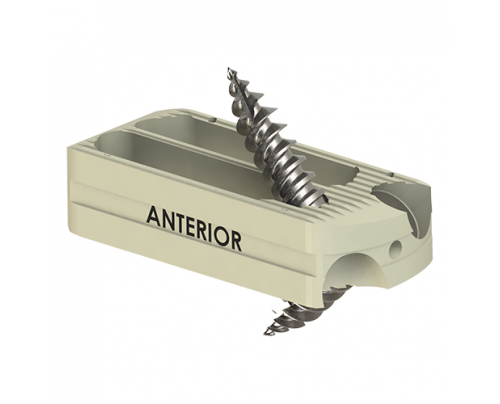 Surface serrations prevent the device from being displaced between the vertebrae. The device is also provided with a lordotic angle for treatment of lordosis. Large bone graft windows accommodate bone graft or synthetic bone inserts, improving the osseointegration with the endplates. The Unity can be placed using a minimally invasive lateral procedure. The bone-anchoring screws incorporate dual-start thread for quicker insertion, as well as locking thread that, while allowing for easier explantation if required, interferes with the screw holes to prevent screw back-out. It is recommended to augment the Unity with supplemental posterior fixation using the SOLFIX2 pedicle screw and rod system.